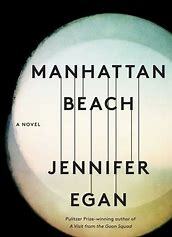 At first glance, the Jennifer Egan of Manhattan Beach does not appear to be the Jennifer Egan of A Visit from the Goon Squad. Her last (and breakthrough) novel was published in 2011. You might recall that it’s an irreverent, slightly futuristic story about punk music, shoplifting and celebrity, featuring footnotes and even a PowerPoint presentation. Manhattan Beach feels like it was written on a different planet. There are no footnotes or PowerPoints. Instead of the wail of electric guitars, we hear the lapping of waves and calling of seagulls. This time around, the bold and eclectic Egan has crafted a big, fat, literary historical novel that is old-fashioned in the best ways: it’s got characters you can root for, a plot that will keep you up at night, and all the delicious things like seduction, suspense and adventure. After this haunting opening section, the novel jumps ahead: Anna is almost 20 and the Second World War is underway. We learn that Eddie has been missing for five years. Is he dead? Is he alive? Did he willingly leave his family? Anna is too preoccupied to dwell on these matters, because she is working at the Brooklyn Naval Yard to support her mother and disabled younger sister. The scenes of Anna at work are gorgeously rendered and the most satisfying in the book. (Egan conducted years of research prior to writing Manhattan Beach, and her attention to detail shines.) Anna starts out measuring the size of tiny parts for war ships, but she hates the monotony. Instead, she wants to be a diver, performing underwater ship repair in Wallabout Bay. Although her aspirations are met with sexism and ridicule, Anna is intrepid. She proves herself time and time again to become the first female civilian diver—a job that does far more than pay the rent. It slakes a deep hunger within her: “Whatever direction Anna went… she was drawn inevitably onto the piers.” Even as the novel unfolds and sweeps the reader away with its various scandals (some easier to swallow than others), Anna keeps the story feeling grounded and fresh. Manhattan Beach is sobering, yes. But it offers up moments of clarity and compassion that make it a deeply rewarding page-turner.